Nepal is a country of multi-ethnic communities. Every ethnic tribes have their unique culture, traditions, language and food habits. Thus, Nepal is paradise for people with discerning palate. Although some of the foods in Nepal have been influenced from its neighboring countries but many others have their unique taste because of giving importance to the locally produced spices and ingredients . Geographical diversity has aided a lot in bringing variations in taste of Nepal. Nepalese food are not only rich in taste but also possess higher nutritional value. In fact, food in Nepal are far more hygienic than most of other Asian foods since they rely more on herbs and spices rather than on oil and fat. Ginger. garlic, red chillies, fenugreek, cumin, turmeric and coriander are commonly used spices in Nepal while the dishes are cooked mostly in mustard oil. I have hereby attempted to acquaint you with some of the food from Nepal by providing the list of top 10 foods in Nepal. These foods have been enlisted purely in accordance with my personal judgement and the list does not necessarily have to be in that order. Available throughout Nepal, Dal Bhat Tarkari is the most popular food of Nepal in which boiled or steamed rice (bhat) is served along with dal (lentil) and curry (tarkari). Other supplements like achar (pickle) and yoghurt can also be included. Dal bhat tarkari is the wholesome meal that provides great example of balanced diet. Momo is the second most popular dish of Nepal. 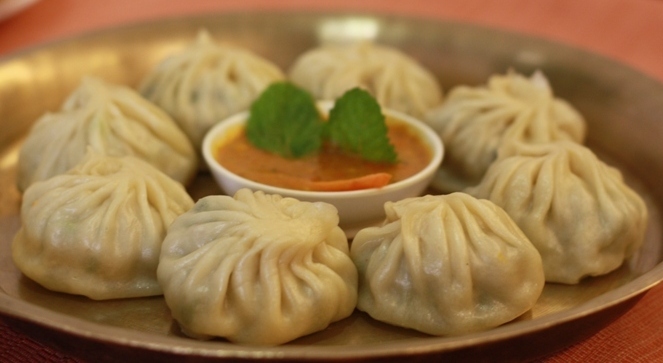 Momo is available in all hotels and restaurants in Nepal. There are several varieties of momo. Momo is the dumpling which is filled with minced meat or vegetable. Based on the filler used, there are chicken momo, lamb momo, pork momo and vegetable momo. Buff momo (Momo with minced buffalo meat) is the most popular momo in Nepal. It is served with spicy chatni and eaten hot. Momo can either be steamed or fried. Dhido is a corn porridge made chiefly of maize flour but barley, millet and other corns can also be used. Dhido is sugar free and healthy meal. Dhido is available in most of the restaurants in Nepal. It is served with gundruk (dried and fermented vegetable) in villages but at hotel, you can order for dhido with ledo masu ( gravy meat of chicken, goat or pork cooked by adding spices). Aalu tama is a traditional dish prepared especially in hilly region. Potatoes (Aalu) blend well with bamboo shoots (Tama). Aalu tama tastes even better if you add black eyed beans to it. Alu tama is noted for its sour taste. Yoghurt can be added to balance the strong taste of bamboo while garnishing the soup with fresh coriander will offer better looks to the dish. Yomari is the special dish of Newars. It is prepared by filling the dumpling of rice flour which is shaped in the form of fig with mixture of molasses and sesame seeds. Although yamori was traditionally prepared especially in Yamori Punhi (the full moon night of Poush month of Nepali calendar), these days, yamori is available in all Newari hotels in Kathmandu. It is the Newari sweet dish that is best served hot. Yamori is steamed in a pot called potasi and molasses can be substituted by lentil paste or milk solids called Khuwa. Also known as Nepali pizza, the Newari dish of Chatamari is a pancake made up of rice flour. Chatamari is a compulsory dish of Newar in festive occasions like Dewali or Degudeopuja which falls in April or May month of English Calendar. You can either eat the plain chatamari or if you wish to add more taste, Chatamari can be topped with eggs, meat or vegetable. Chicken goes well with chatamari. Selroti is the ancient dish of hilly region that is cooked especially in Tihar- the festival of lights. Sel Roti is prepared out of semi liquid rice flour to which spices like cardamom and cinnamon and butter, cream, banana and sugar is added. A ring of semi liquid rice flour mixture is added to the oil that is under high temperature. Sel Roti is ready when both sides get its golden brown color. Kheer or rice pudding is a sweet dish prepared by adding rice, dried fruits, cinnamon powder and cardamom powder to the boiling milk and leaving it on the neat for about an hour. It is the customary practise to eat Kheer on Srawan15. Samyebaji is the traditional newari recipe that has been passed down from generation to generation. It is the major dish during religious occasions while it can also be prepared in ordinary days due to its simplicity. Samyebaji consists of beaten rice, black soyabean, smoked meat, boiled and marinated potato, roasted meat, boiled and spicy beans, boiled egg, lentil pancake, garlic, ginger, pickle, green vegetables and aila (Newari homemade rice liquor). Masu Ledo is the Nepali food that consists of spicy meat in gravy form. Usually, Masu is served with rice. Cow is considered too sacred to eat.